If you are a cheese lover, you must read this post! I was invited to the Classic Jacob’s Creek Wine Event at Friendscino Restaurant& Darts Bar in Taman Pelangi. Along with the wine, there were also preview of the Parmigiano-Reggiano Cheese Wheel. 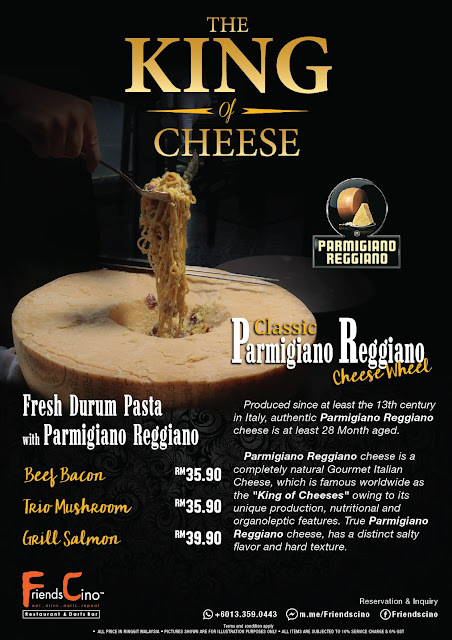 Introducing you the King of the cheese: Parmigiano-Reggiano Cheese Wheel. Parmigiano-Reggiano cheese is a hard granular cheese originated from Italy where both the production of milk and formation of cheese take place. It is sometimes used interchangeably with “parmesan” as it refers to the actual Parmigiano-Reggiano in Europe. From the picture, you can see that the detailed and extensive cutting of the aged wheel by skilled craftsman. The words on the wheel are Parmigiano Reggiano. Parmigiano-Reggiano is typically aged for a minimum of two years before it`s sold. An average wheel weighs around 39 kilograms and uses 550 litres of milk to make. There was a live cooking of fresh durum pasta with Parmigiano-Reggiano cheese wheel by the chef. Basically he cooked the pasta in the pan first before pouring it into the cheese wheel to mix it with the cheese. The whole process wasn’t that long but I couldn’t wait for it to be done so that I can try it! Mushroom and durum pasta. This is definitely my favorite pasta of the night. It is so creamy and thick. As stated in the name, this is a grilled salmon pasta. They are not stingy with their salmon and you definitely get what you pay. Since this is a wine event, there were definitely wine. Velvety and spicy with red currant, black cherry and fresh mulberry. This is a white wine. It is soft and fresh with creamy peaches, fresh melon and a toasted oak finish. Since the pasta is very creamy, this wine served its purpose in balancing it. Spicy yet velvety with vibrant cherries and a backdrop of cedar oak. This wine goes well with those powerful food like roasted meat, BBQ meat and so on. The price of the wine is RM 130 per bottle and RM 215 for 2 bottles.